Any large moving system that involves over three hundred pounds of weight and a lot of tension based force (i.e. your garage door) will suffer through a lot of wear and tear. Minimizing that accumulated damage will help the mechanism's various parts last longer, and remain safe and functional. There are a lot of working components that help your garage door move, and they all need to be checked regularly to make sure their condition remains optimal. Our technicians will straighten any bending in the tracks, lubricate the rollers and repair or fill out any dents and cracks in the panels. This will keep the system's performance optimal and preserve its curb appeal. The condition of your garage door cables and springs must be great, as otherwise the safety and functionality of the system could be compromised. Our team will make sure there are no fraying cables, and that the components that provide your door with the tension based force it needs to be able to move (a.k.a the springs) aren't getting ready to break. If spring adjustment is required, we'll take care of it on the spot and prevent the panels from getting unbalanced. In order to make sure that your overhead door is safe to use, we'll perform a couple of safety tests that will determine whether sensor realignment is required or not. The photoelectric eyes that alert the garage door opener when an obstacle is blocking the door's path must be perfectly positioned, as otherwise they will fail to work properly, and may compromise user safety. 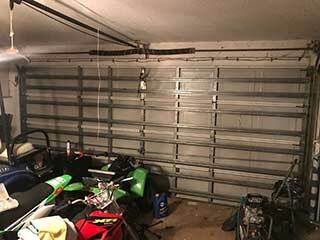 If you want to avoid a lot of preventable problems with your opener, springs and other hardware parts of the system, contact our experts at Garage Door Repair Minneola and join our maintenance service.